Rising property tax bills affect virtually everyone in the state, whether they’re homeowners or renters. We asked Texans how they feel and whom they blame for the increases. The state House and Senate twice came to a stalemate on property tax reform during this year’s legislative sessions. The Senate quickly passed its version of a property tax bill during the July-August special session. The House, however, took a far more expansive approach — considering proposals ranging from the narrow (carving out a new exemption for Purple Heart recipients) to the explosive (abolishing school property taxes altogether). In the end, the two chambers still couldn’t agree. As lawmakers again debated property tax reform during the special session, we asked Texans to give us their take on the state-vs.-local fight over how to regulate rising property values. Here’s a look at the legislative debate and how some Texans feel about the proposed measures. 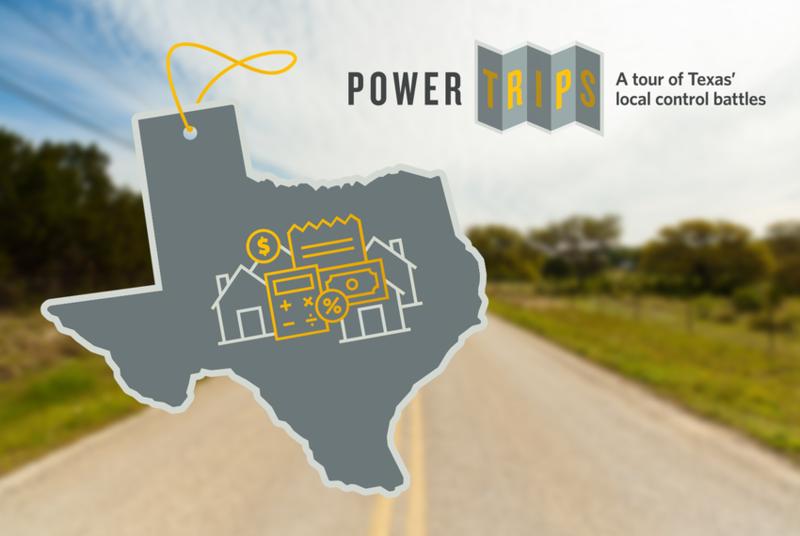 This is the third story in an occasional series exploring how Texans are affected by the fight between state and local officials over regulatory power — and where people like you stand on those issues. What state-vs.-local issue should we tackle next? Vote here. How do property values differ across the state and what accounts for their increase/decrease? The property taxes Texas homeowners pay are determined by how much appraisal districts say land and buildings are worth and the tax rates that local government entities (like cities, counties and school districts) each set. While the state is constitutionally prohibited from collecting property taxes, such revenues largely fund local governments. What did the 85th Legislature do about property taxes this year? It’s not that each chamber didn’t try — they just couldn’t agree. The hottest point of contention was whether local governments should get voter approval when property taxes on existing land and buildings rise. The author of key property tax legislation, Republican Sen. Paul Bettencourt of Houston, said the new election thresholds were meant to give landowners a stronger mechanism to curb rising property tax bills. During the regular session, the Texas House unanimously approved a bill that left in place current law allowing residents to petition for a vote if existing revenue streams increase by 8 percent. Their version excluded the Senate's automatic election provision — something Lt. Gov. Dan Patrick wanted. The House’s tweak to the property tax bill angered leadership in the Senate and partially led to the special session. How did that change during the special session? Did the two chambers come to an agreement? The House agreed to automatic elections when larger cities and counties increase tax collections on existing buildings and land by 6 percent compared to the prior year. The Senate wanted that threshold at 4 percent. By adjourning after accepting Senate changes to school finance legislation Tuesday night, the House forced the Senate to either accept its version of the property tax bill or let it die. The early adjournment and refusal by the House to appoint conferees to iron out the differences in the property tax measures frustrated key players in the Senate, notably Bettencourt and Patrick. "We missed some major opportunities, but what I'm most upset about is the House quit tonight," Patrick said at a press conference Tuesday evening. "With 27 hours to go, they walked off the job," he added. Yet the Senate’s all-or-nothing approach ended up killing several other provisions, including ones that would have made the property tax system more transparent and lowered payments for the elderly, the disabled and some military members. "I have been working with members of the Senate for several days on Senate Bill 1, we have made our efforts, so I don’t want there to be in any way a suggestion that we have not, will not, would not work with the Senate on such an important issue," said State Rep. Dennis Bonnen, R-Angleton. "If we appointed conferees now, it would kill the bill because there is not enough time," he added. How do the Legislature’s proposals differ from what local governments want? City and county leaders said an automatic election on tax rates could limit their ability to fund services that residents expect, such as hiring police officers, building new parks and filling potholes. The issue with the Senate’s version of the property tax bill during the regular legislative session, some local officials argued, was that it sidestepped the real issue that leads to rising tax bills: school districts levying more in property taxes because lawmakers won’t change the state’s system for funding education. How would new laws have affected Texans’ property tax bills? Even if the House and Senate agreed on SB 1, Texans wouldn’t have seen their property tax bills automatically decrease. Many local officials and lawmakers said the best way to prevent rising property tax bills was to provide more state funding for education, so school districts wouldn’t feel pressured to raise property tax revenues. In the special session, senators weren’t willing — as the House was — to add $1.8 billion to what the state spends on public schools. Plus, the automatic election trigger would do nothing to decrease individual property tax bills. The elections would only happen if property tax revenues increase. The House also considered legislation that would have lowered property tax payments for some Texans, including the elderly, disabled and military members, but those provisions died when the Senate adjourned a day early without considering them. Correction: An earlier version of this story incorrectly described how sending an additional $1.8 billion in state funds to public schools would affect local property tax rates. Many local officials and lawmakers said that additional state funds could slow increases in school district property taxes.